170 Brisbane St. Google Maps. The usual meeting for the transfer of Publican’s licenses was held at the Court House on Monday morning last. J. Whiteford, Esq, Chairman of the Quarter Sessions, presided as Chairman. The on– other parties were W. Gunn, Esq, Police Magistrate, and his Worship, the Mayor. 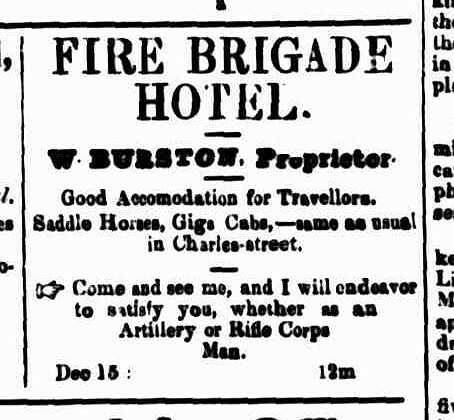 The first application made was from John Sullivan, late of the Fire Brigade Hotel, Brisbane-street, to William Burston. His Worship the Mayor, urged a “—– objection” to this transfer, inasmuch as he thought Mr Sullivan had been trafficking in public house licenses. Mr Sullivan.–If then, Sir, I have been doing as you represent, it has been an unfortunate “traffic’ for me, as I have nearly emptied my pocket by so doing. His Worship remarked that he had nothing to say against Mr Sullivan’s character. He had simple made the foregoing observation — the discharge of his public duty. 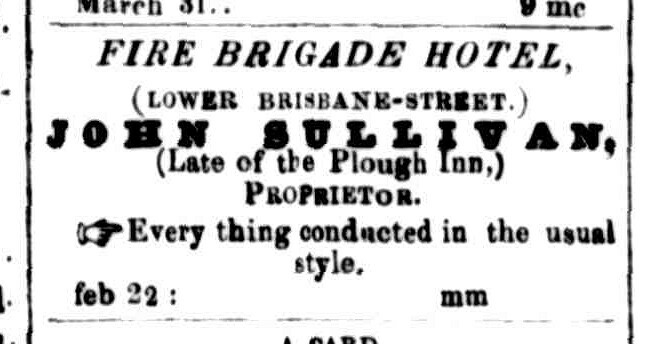 The Police Magistrate approved of the transfer of the licenses, and thought Mr Sullivan highly competent to conduct such an establishment as the Plough Inn, which had induced him retire from the Fire Brigade Hotel. APPLICATIONS FROM NEW APPLICANTS FOR OLD LICENSED HOUSES. Edward Bonser, Wilmot Arms Hotel. 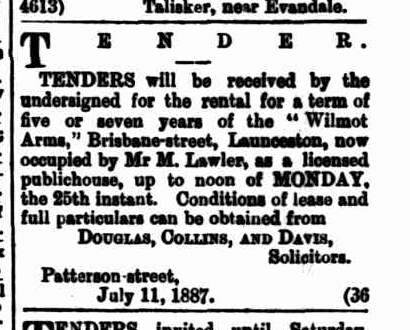 These two licences were granted, and the name of Wilmot Arms Hotel was allowed to be changed to Fire Brigade Hotel. A compliment was paid by Mr. Coulter to Michael Lawler, for the clean and satisfactory condition of the Victoria Hotel. This entry was posted in Brisbane Street, Hotel and tagged location, no dates, no photo by Xenith. Bookmark the permalink.